Docker images are available at microsoft/dotnet for .NET Core and ASP.NET Core. .NET Core 2.2 Preview 3 can be used with Visual Studio 15.9 Preview 3 (or later), Visual Studio for Mac and Visual Studio Code. The feature I am most stoked about in ASP.NET 2.2 is a subtle one but I remember implementing it manually many times over the last 10 years. 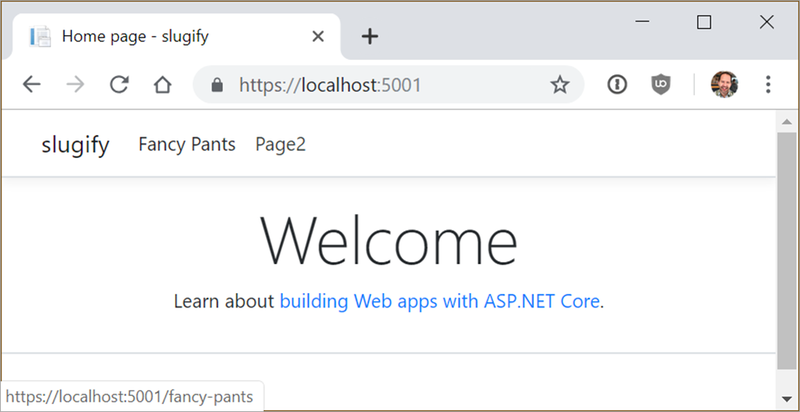 I'm happy to see it nicely integrated into ASP.NET Core's MVC and Razor Pages patterns. ASP.NET Core 2.2 introduces the concept of Parameter Transformers to routing. Remember there isn't a directly relationship between what's in the URL/Address bar and what's on disk. The routing subsystem handles URLs coming in from the client and routes them to Controllers, but it also generates URLs (strings) when given an Controller and Action. Here I'm asking for the page. That asp-page attribute points to a logical page, not a physical file. We can make an IOutboundParameterTransformer that changes URLs to a format (for example) like a WordPress standard slug in the two-words format. Now when I run my application, I get my routing both coming in (from the client web browser) and going out (generated via Razor pages. Here I'm hovering over the "Fancy Pants" link at the top of the page. Notice that it's generated /fancy-pants as the URL. So that same code from above that generates anchor tags <a href= gives me the expected new style of URL, and I only need to change it in one location. There is also a new service called LinkGenerator that's a singleton you can call outside the context of an HTTP call (without an HttpContext) in order to generate a URL string. This can be useful if you are generating URLs outside of Razor or in some Middleware. There's a lot more little subtle improvements in ASP.NET Core 2.2, but this was the one that I will find the most useful in the near term. Sponsor: Check out the latest JetBrains Rider with built-in spell checking, enhanced debugger, Docker support, full C# 7.3 support, publishing to IIS and more advanced Unity support. OMG. LinkGenerator is a godsend. I've needed this functionality so many times. With "FancyPants" and "fancy-pants" both return the same HTML content, one of them should be used as the canonical URL. What's the best way in ASP.NET Core to redirect those non-canonical URLs to the canonical one with a 301 or 308 status code? In Scott's example only "fancy-pants" will return the HTML content. "FancyPants" will 404. Are there plans to introduce something like T4MVC into core? I see some Microsoft employees using _ before member variables, is that something new? If I'm not mistaken as per the guidelines we should not use _ before member variables. Been thinking about this for some time. Do you know if slugify support will be enabled when calling UseMvc or will we have to explicitly include :slugify in the template?